Review - Shopping For Member | A Savings WOW! 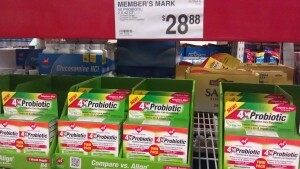 We went to our local Sam’s Club location to purchase the Member’s Mark 4X Probiotic. While we were there, we also had a chance to try out their rotisserie chicken that was shredded and put on a bun to make a delicious sandwich! It took a few passes through the health and beauty aisles to find the section where it was located. When we finally found it, we purchased one of the twin packs that contains a supply enough for 3 months. Prizes: They will be giving away a $100 Sam’s Club gift card (Grand Prize), and four sets of Member’s Mark 4X Probiotic (3 month supply). Please RSVP here (enter the URL to your Twitter profile) to be eligible for one of the prizes. All winners will be chosen using random.org from the RSVP link and winners must be present and participating in the party at the time that they are drawn as a winner, and respond within 5 minutes of being called). We are trying out Member’s Mark 4X Probiotics and will be sharing our experiences with it in the next couple of weeks. Stayed tuned!